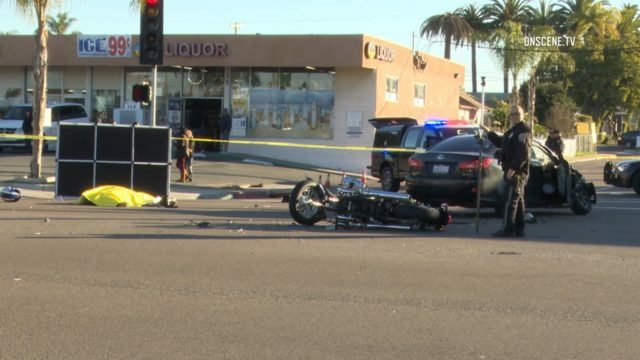 A 54-year-old motorcyclist died Friday in a collision with a vehicle in Chula Vista. The Chula Vista Police Department’s preliminary investigation determined that the motorcyclist was heading north on Broadway when he entered the intersection with F Street on a green light shortly before 6 a.m. The driver of a vehicle going south on Broadway made a left turn on a circular green and collided with the motorcycle, police said. The driver of the vehicle and a passenger sustained minor injuries. The motorist remained at the scene and cooperated with the investigation, police said. Investigators do not believe alcohol or drugs were a factor, but the collision remains under investigation. Anyone with information was asked to call the Chula Vista Police Department at (619) 691-5151.